Spectre.ai, the fastest growing broker-less and fraud-free financial trading platform, recently announced the release of a brand-new user interface for its revolutionary platform making online trading in crypto, forex and commodities simpler and more convenient than ever. After surpassing all options & CFDs providers as the number one destination online for safe online financial trading, Spectre.ai’s new version of its popular and unique trading platform (currently only available via web access), offers a unique combination of a feature-rich trading platform and ease of use. The mobile app will launch in around March/April 2019. Instead of traditional forex, CFD, options and speculative trading platforms, SPECTRE.AI offers a much safer, trust-less, broker-less trading platform, and an exciting new asset class – Smart Options. With Smart Options, users simply predict the movement (up or down) of cryptocurrencies, currency pairs & commodities in a given timeframe. The cool part is all the settlements happen in Ethereum (ETH) meaning no one has control over your funds except you! Spectre is by far the safest online trading environment in the world and offers a massive leap forward in technology. Also, if traders so wish, trades taken via the Wallet account occur in real-time across the Ethereum blockchain instantly making fraud impossible while also eliminating issues of withdrawals. High-performance tools to manage trades and analyze data. 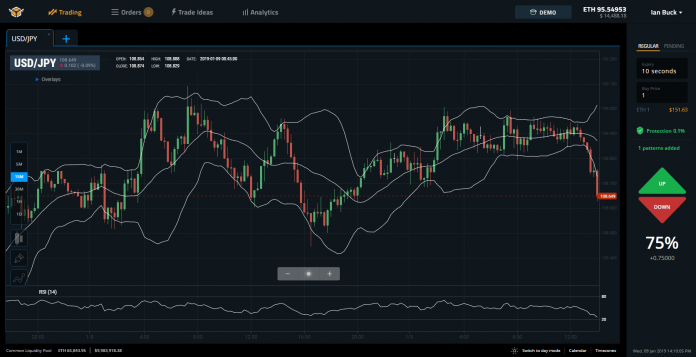 Includes charting tools and indicators, in-platform trading calendar and news alerts, built-in in-depth analytics, trade ideas and alerts. Spectre has kindly agreed to give 100 promo codes ($100 worth of Ethereum) exclusively to CCN readers that open a live trading account with them. Spectre will then place a welcome bonus of $100 worth of Ethereum into your live account so that you can start trading immediately and see exactly how easy it is to generate profits on their unique trading platform. A deposit of equal amount to the bonus or $5000 in trading volume needs to be reached in order for profits to be withdrawn.